For just the second time in team history, the Vikings will be crossing the pond and playing a game outside of the United States. The Cleveland Browns (0-7) have yet to win a game this season and things seem to be getting worse. Iron-man left tackle Joe Thomas has played over 10,000 consecutive snaps in his illustrious NFL career before going down for the season last week with a torn triceps injury. The injury doesn’t exactly bode well for a team that’s being led by a rookie quarterback in DeShone Kizer and facing a defense that has a few defensive player of the year candidates on their roster. You may smirk and laugh heading into this game, but crazier things have happened in the NFL. The most dangerous teams in the league are the teams that have nothing to lose…and when you’re 0-7 that’s exactly the position you’re in. The Browns are one of just two teams left in the league that has yet to win a game this season. The other being the San Francisco 49ers. Does losing seven straight games to start the season actually mean the Browns are bad though? Probably. But when you read between the lines, this team might actually be better than their record perceives. The Browns have lost four games this season by a field goal, including a heartbreaking loss to the Tennessee Titans in overtime at home last weekend. Spencer Drango will be filling in for the absence of Joe Thomas this weekend and will be tasked with the job of protecting DeShone Kizer’s blind side from Everson Griffen who is currently 3rd in the league in sacks with 9, through 7 games. Cleveland’s quarterback situation has been a mess for nearly 20 seasons but at the moment it seems to be that the rookie DeShone Kizer is the best option they have to place under center. When you look at his numbers you may scratch your head and wonder why Hue Jackson even puts this kid on the field. 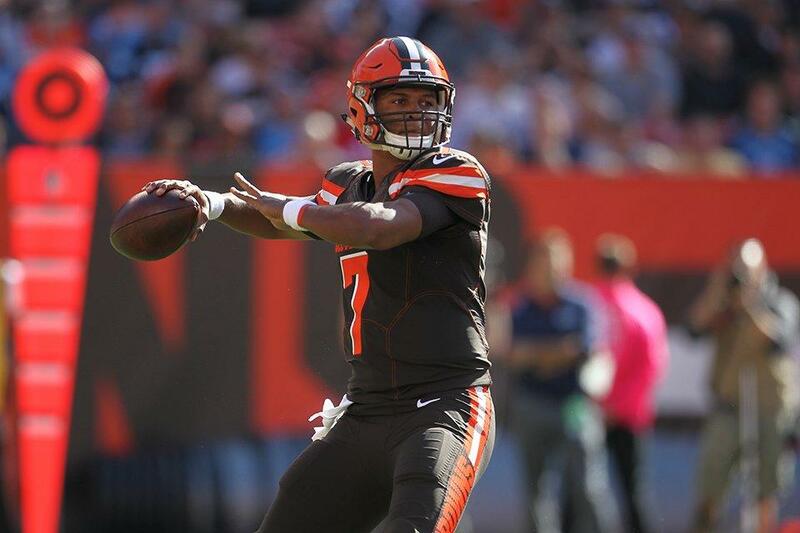 Kizer has only thrown 3 touchdown passes this season and leads the league in interceptions thrown (11), but when the Cleveland offense has had much of any success this season it wasn’t Cody Kessler or Kevin Hogan leading the charge…it was DeShone Kizer. Facing a top 5 defense isn’t a fun situation to be in for a rookie QB, but maybe the London crowd will benefit Kizer in a way that we can’t understand. …or possibly destroy any confidence that he may have left. Fire up the Jet! Latavius Murray was the Vikings running back that had the hot feet last weekend against the Ravens after running for 113 yards and a touchdown on 18 carries. But, the Browns have struggled to cover the flats through 7 weeks this season, therefore Jerick McKinnon might be the Vikings back that poses the biggest threat to Cleveland because of his elusiveness and versatility in the passing game. “Jet” McKinnon is a running back that thrives on momentum. If the Vikings can get him going in the running game early and often that should open up the second feature to McKinnon’s game in the flats. Look for the “Jet” to see a majority of the carries this week. Hit DeShone Kizer early and often. 3 touchdowns and 11 interceptions. That’s rookie QB DeShone Kizer’s stat line halfway through the season. You can bet the farm that Mike Zimmer’s defensive game plan is to destroy any confidence that Kizer still holds. This is the first time since 2006 the Browns will be starting someone else at left tackle. 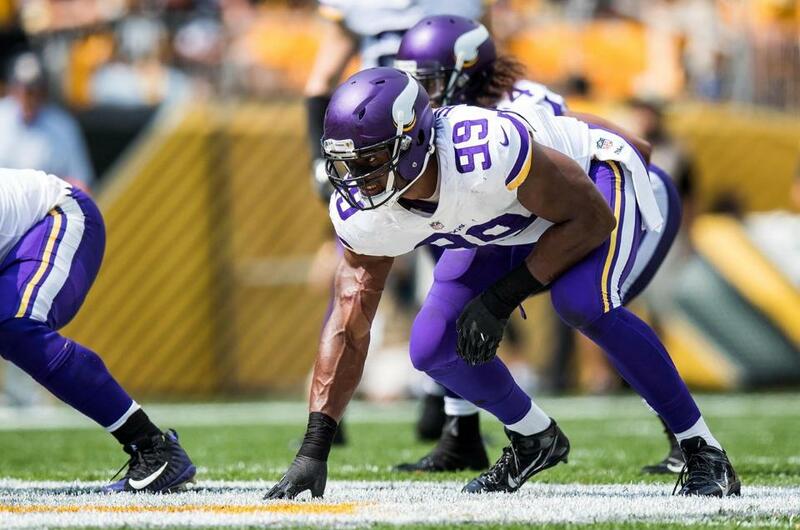 I love Everson Griffen and Danielle Hunter’s odds against Spencer Drango and Shon Coleman. I’m confident the Vikings defense will be putting Kizer on his back regularly and often. After getting hit repeatedly that should lead to some bad decisions from the young QB. Capitalize on turnovers. The Cleveland Browns give the ball away more than any team in the NFL. They have a -11 turnover ratio which is the worst in the league. Does that mean the Vikings will have 3+ interceptions this week? No, not necessarily, but the chances are still high. Case Keenum has played well up to this point filling in for Sam Bradford, but he’s not going to lead the offense down the field drive after drive and pile on the points. If Keenum can generate some points off of turnovers, the Vikings defense should be able to do their part and prevent the Cleveland offense from sniffing the end zone. Give me one Vikings prediction, one Browns prediction, and a final score prediction. It feels like every time we think the Vikings should walk through a game with ease, they usually end up making it harder on themselves than it has to be by committing turnovers or unnecessary penalties. As always, taking care of the football and playing good defense is the key to winning any football game. The Vikings have been doing both well so far this season and this week shouldn’t be any different. The last time the Vikings traveled to London for a game it was almost as if the team took the Metrodome with them. Make no mistake about it, the purple and gold are alive and well in the United Kingdom. I expect the Vikings defense to be energized and I believe DeShone Kizer will be in for a long day. If everything goes as planned the Vikings should win by 10+ points…but as I’ve already mentioned; the teams that have nothing to lose usually take the biggest risks. Expect some unusual play calling and gutsy calls from Hue Jackson’s Browns. This is the second time in franchise history the Vikings will be playing in London. The first adventure was a 34-27 win over the Pittsburgh Steelers back in 2011. Despite the impressive season he’s having, Vikings WR Adam Thielen is still looking for his 1st touchdown of the season. TE Kyle Rudolph needs 60 yards to pass Leo Lewis for 15th most receiving yards in team history and 2 receptions to pass Rickey Young for 10th most receptions in team history. Vikings Safety Andrew Sendejo is serving his 1 game suspension by the NFL this week for his hit on Ravens WR Mike Wallace last week. The 1st overall pick from the 2017 NFL Draft (Myles Garrett) did not make the trip to London this week with his team, due to his placement in the league’s concussion protocol. You will not see him on the field this week against the Vikings offense. Head Coach Mike Zimmer needs 1 win to tie Mike Tice for 5th most wins by a head coach in franchise history. QB Sam Bradford, OL Jeremiah Sirles, and DE Stephen Weatherly are all OUT for Sunday’s game. My Vikings prediction: Adam Thielen scores his first touchdown of the season this week. My Browns prediction: DeShone Kizer: 1 touchdown, 2 interceptions, and 190 yards passing.